They take care of us whether we’re celebrating our triumphs or drowning our sorrows, but where do bartenders go and what do they do when they’re not behind the stick? Now that spring has sprung (and seemingly gone straight to summer), it’s a great time to get out and explore our city. 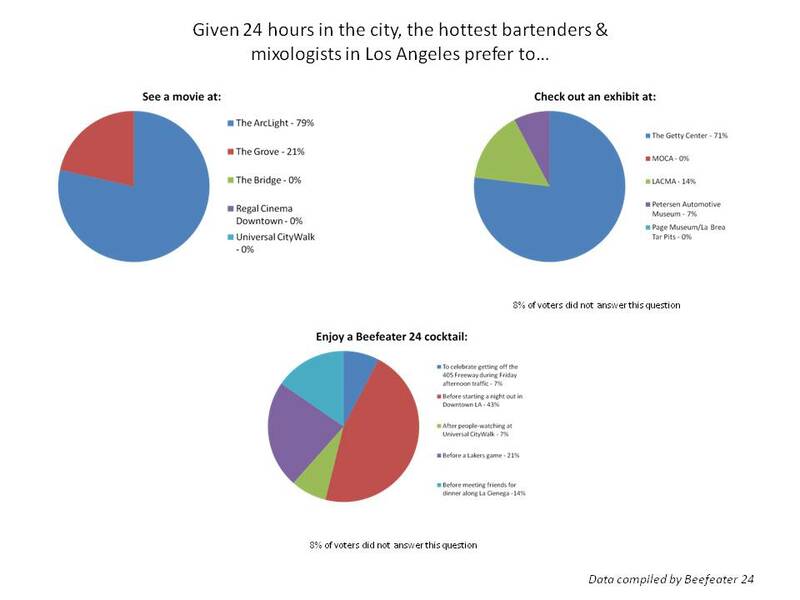 Beefeater 24 surveyed Los Angeles bartenders from the Edison, the Doheny (now Caña), Rush Street, and more to see where they would go in their Ultimate 24 Hours in LA. Now, I can’t vouch for the scientific validity of this survey, but there are some fun questions and a few surprises to be found in the results. Let’s review them, shall we? Table I asks bartenders where they go to hike, hear live music, surf, and take a stroll. No surprises here, with Runyon Canyon, the Hollywood Bowl, Venice Beach, and the Farmer’s Market coming out on top. 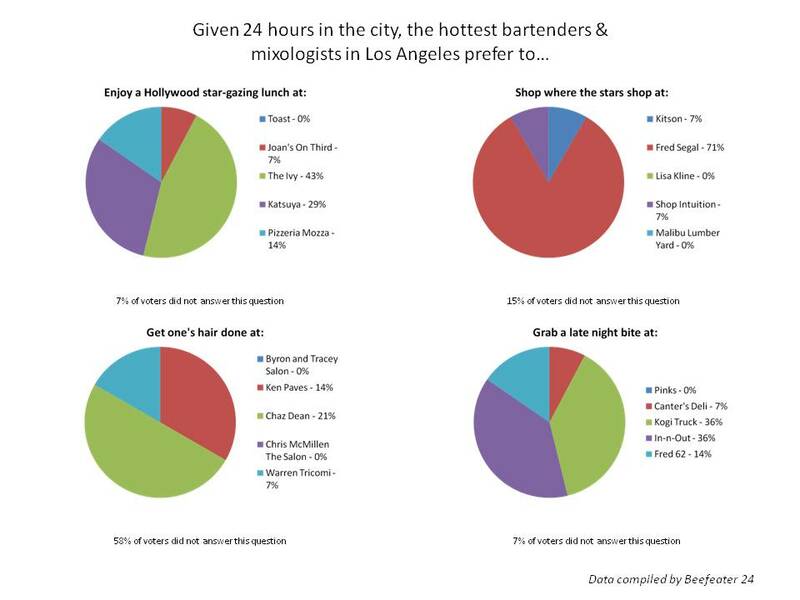 Although I’m curious, which bartenders enjoy strolling through Rodeo Drive? Table II has a couple of touristy things: where bartenders prefer to eat a “star-gazing lunch” (the Ivy) and “shop where the stars shop” (Fred Segal is the big winner). Then an odd one, where do bartenders get their hair done? Chaz Dean apparently, though 58% of the voters didn’t respond. Kogi BBQ and In-N-Out tied in the Late Night Bite category. Table III starts off with a couple of big winners: The ArcLight for favorite movie theater, and The Getty Center for art exhibits. Surprisingly, not one vote for MOCA despite its downtown location and younger, hipper demographic. 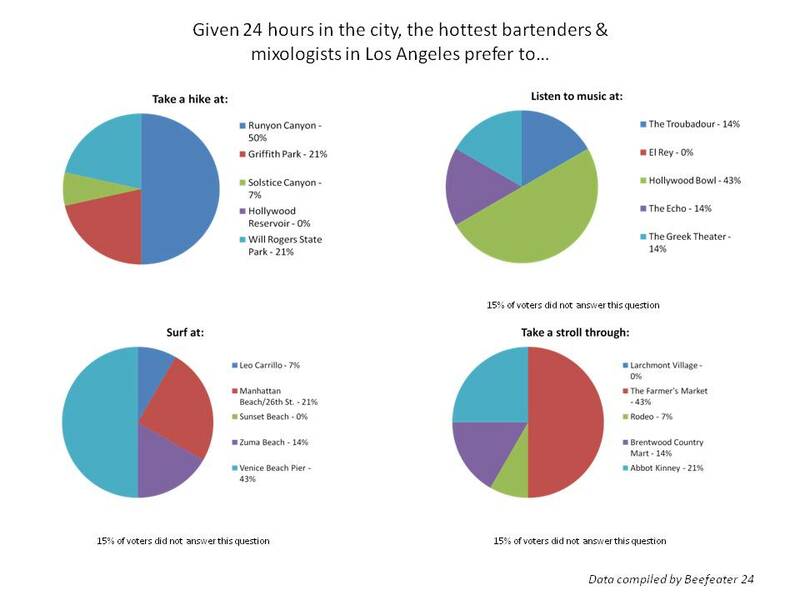 Finally, bartenders were asked when they preferred to enjoy their Beefeater 24 cocktail, with 43% answering “before starting a night out in Downtown LA.” Here’s a question for a future survey: what cocktail that would be?